Practical, solid and dependable. That has always been the Skoda Fabia. Exciting it may not be but it does have an appeal. Traditionally that appeal tends to be among the more 'mature' driver shall we say. 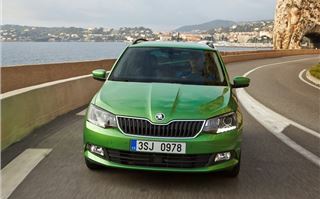 Despite the attempts of the vRS version, the Fabia has never been a young person's car. 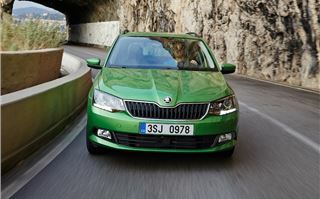 But Skoda is attempting to change that with an updated model, that's more stylish and less boxy in its appearance. The Skoda designers have certainly done a good job with the hatch, but now it's the turn of the estate version. And that's never an easy task. Luckily, the Fabia Estate echoes its larger Octavia sibling with the same neat lines and tidy styling. It's far more handsome than its predecessor, albeit with a similar tall profile. One question does raise its head though: with the proliferation of small crossovers, is there still demand for small estates? Renault no longer sells the Clio Estate in the UK and there's no Peugeot 208 SW either. 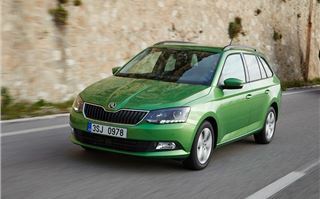 Plus Skoda already has a small estate on its books – the Rapid Spaceback – so why does it need the Fabia Estate too? Well the firm says the Rapid is a more 'lifestyle' choice that sits above the rather more sensible Fabia. 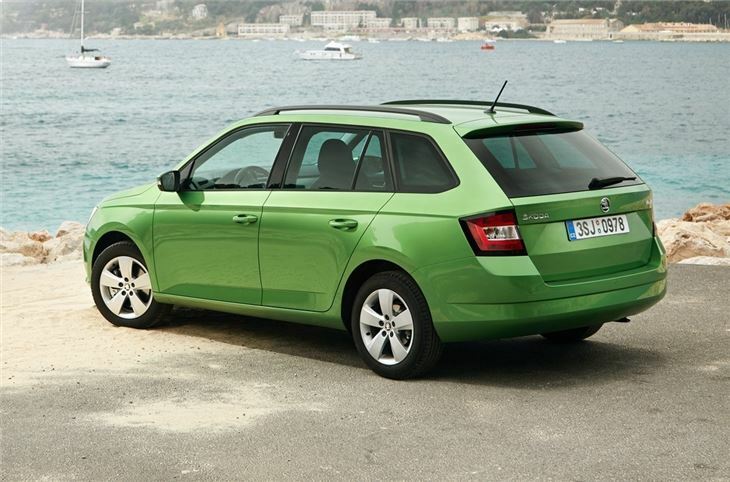 You won't be surprised to find that the Fabia Estate feels very much like the hatchback from behind the wheel. It's comfortable, easy to drive and rides well for a small car. There's not too much in the way of excitement, but it does all the basics and does them well. It's only slightly longer than the hatch equivalent (around 30cm) making it easy to park, although if you're not too confident you'll be pleased to know that rear parking sensors come on SE models and above as standard. In fact, equipment levels are very good. Even the basic S model gets DAB radio, Bluetooth and electrically adjustable and heated door mirrors. Although there's no air conditioning and you have to make do with steel wheels. The SE looks the best value, prices start at £13,850, and it gets extras like a leather steering wheel, height adjust on both front seats and the new Mirror Link system. This shows your phone display on the central touchscreen and allows to control certain functions and apps on it. Although at the moment it only works with certain Android handsets. Sorry iPhone users, although there is at least a USB connection. 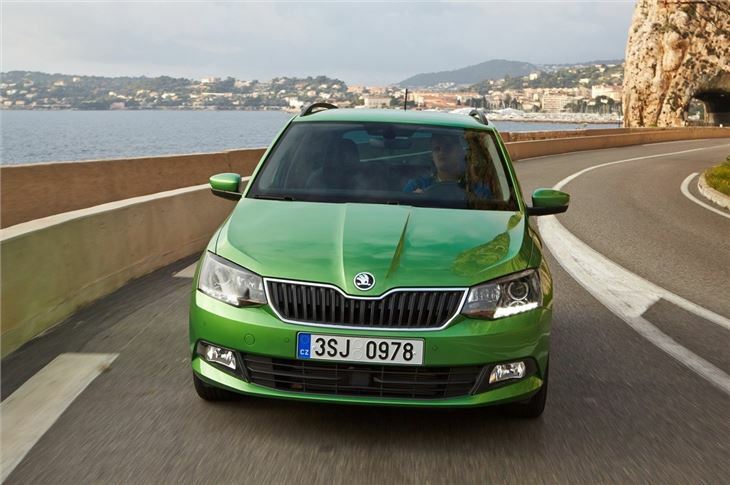 The interior is a big step forward from the previous Fabia, in both design and quality. Again there's an influence from the Octavia with everything a bit more plush, although it still retains that robust feeling. 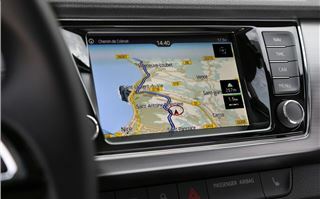 It has a neat layout that's immediately easy to get to grips with and as we've become used to with Skoda, everything works with satisfying simplicity. It's also a touch more spacious with extra elbow room. So, what about the all-important boot? Well, as you'd expect, it's bigger than before at 505 litres, which is more than a BMW 3 Series Touring. 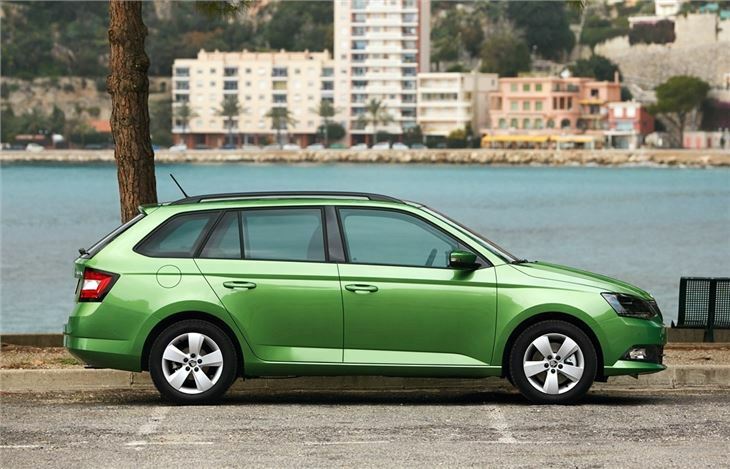 What's more, the Fabia Estate's storage can be increased by 25 litres if you don't go for a spare wheel, but we wouldn't recommend that unless you're desperate for space. The rear seats fold down (albeit not flat) to increase the space to a hefty 1370 litres. Plus the boot opening itself is nice and wide with hardly any boot lip, so getting heavy stuff in and out is easier on your back. The only disappointment is that there are no handles in the boot to fold down the seats in one go. 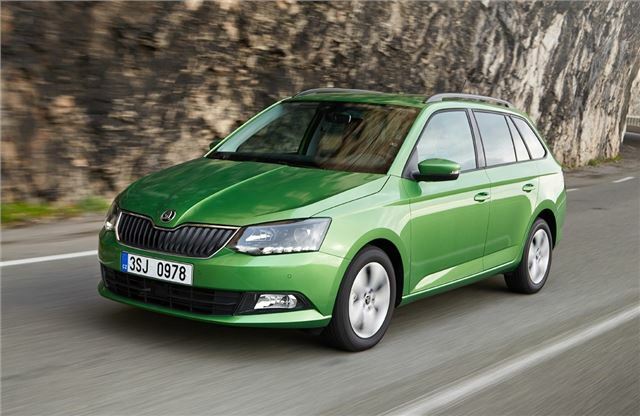 Being a Skoda though, the Fabia Estate comes with plenty of 'simply clever' touches, like an ice scraper that lives in the fuel filler cap and bottle holders integrated in the front door pockets. There's also a useful rubbery phone (or Tic Tac packet) cradle that stops either rattling around the cup holder. The engine range echoes the Fabia Hatch with the exception of the entry-level 1.0-litre MPI petrol which has been dropped. That leaves the more powerful 75PS version of the same 1.0-litre as the base model, replacing the old 1.2 12v. It's a little underpowered and struggles if you have a full load on board, but it's pretty decent around town and reasonably nippy at low speeds, helped by its three-cylinder nature. 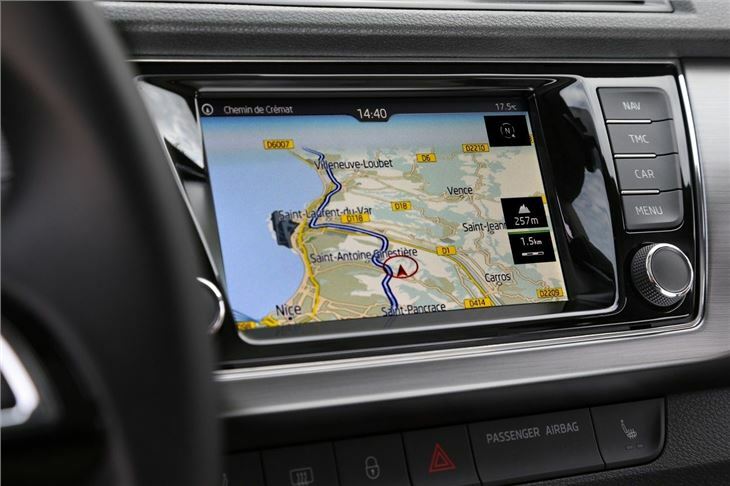 The other petrol is the 1.2 TSI which comes in two versions – a 90PS or 110PS – the latter of which is available with an optional DSG gearbox, with a dry clutch. 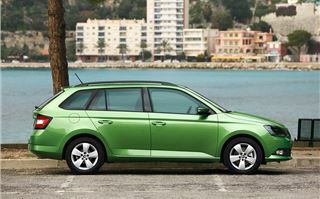 Thanks to its turbocharger, the 1.2 TSI has plenty of get up and go – it's an engine we rate highly and which works well in the larger Yeti, so it's no surprise to find that it's plenty quick enough in the Fabia. It's the engine we'd recommend. The 1.4 TDI is the sole diesel engine, albeit like the petrol there are two variants – a 90PS and a 105PS. CO2 emissions for all the diesel models are below 100g/km which means zero annual tax while the claimed economy figures are mightily impressive – the 90PS model returning more than 83mpg according to the official figures. It's quiet for a diesel and refined too. Despite being a three-cylinder, there's little vibration in the cabin. Practical, comfortable and cheap to run, the good value Fabia Estate may not be a flavour-of-the-month crossover, or have the oddball styling of something like a Nissan Juke, but then it doesn't need to. 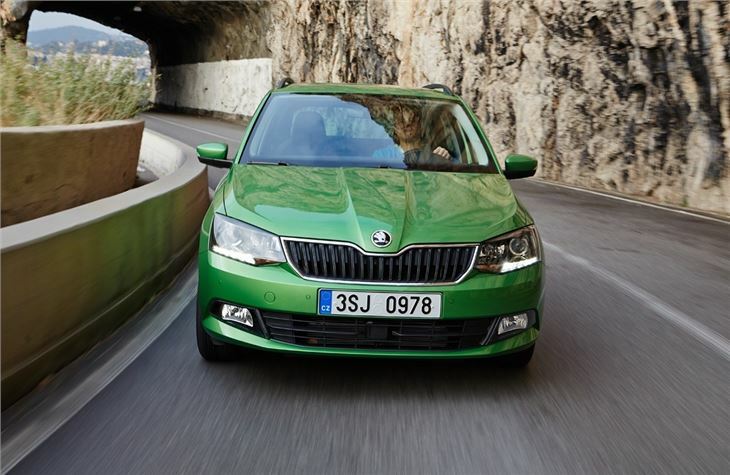 It's the perfect reflection of what Skoda stands for. It offers a lot for the money, especially for those who value useful load space and appreciate solid build quality. The Fabia Estate arrives in March.